The Best Indian Restaurants in Washington, D.C. If chicken tikka masala is sounding delicious while you're touring Washington, you're in luck. D.C.'s long been home to acclaimed Indian restaurant, Rasika, and that's not restaurateur Ashok Bajaj's only Indian spot in town: he also owns the clubby Bombay Club and more casual Bindaas. There are many more sources for great Indian food in D.C.: keep reading for both affordable and refined options. Find Indian street snacks like gunpowder fries, eggplant kathi rolls, lamb kebabs, rice lentil pancakes, and sticky toffee pudding at Bindaas. This restaurant also serves naan in unique flavors like spinach-paneer, bacon-cheese-chili, garlic-cilantro, or olive oil. Load up on small plates and try everything at each of Bindaas locations: you'll find the restaurant in Cleveland Park and a new location in Foggy Bottom. Everyone from Former Secretary of State Madeline Albright to Dr. Deepak Chopra has dined at the stately Bombay Club in downtown D.C. 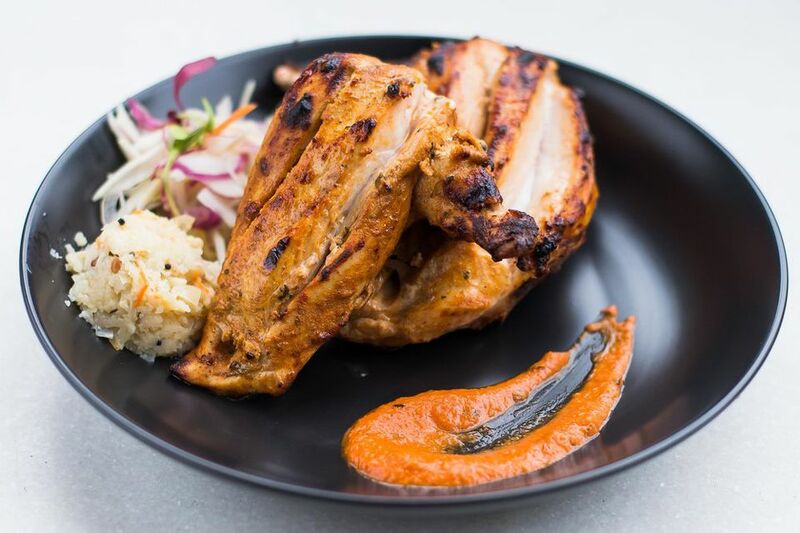 This is a fancy spot for cuisine from all over India, with dishes like a seafood grill, mulligatawny soup, Kashmiri lamb, and green chili chicken. The Sunday brunch buffet is a huge draw too — and a deal at $25 per person. Each meal includes items like appetizers, a rotating array of main dishes, rice and breads, Indian desserts, and fresh fruit. For $39 per person, you'll get unlimited champagne too. Get all this and a soundtrack from a pianist too. Take a tour of Bombay without leaving D.C. at the new Bombay Street Foods, which opened in 2018 in the upper Northwest neighborhood of Columbia Heights. Beyond staples like chicken saag or paneer tika masala, the menu has sections for Indian Chinese cuisine, street snacks like kati rolls, and "monsoon season" dishes like vegetable fritters, tangy chicken, or deep-fried spiced cheese cubes. Finish the meal with pistachio ice cream or homemade sweet milk balls in saffron milk. On warm evenings in D.C.'s H Street NE neighborhood, folks line up to order food from the inviting and down-to-earth Indigo. It's an affordable and delicious spot for Indian dishes, plus there's outdoor seating for dining on the patio under the stars (or string lights). The family-owned restaurant is known for its dishes like spicy chicken masala, butter chicken, goat curry, or lamb curry. Vegetarians can create a platter by picking two dishes like cauliflowers and potatoes or cheese and spinach with rice, chickpeas, spinach, and cilantro. Most everything on the menu is under $15. A classic in the charming and laidback neighborhood of Cleveland Park, Indique's been serving up lamb vindaloo since opening in 2002. The restaurant offers snacks like veggie mini dosas or pickled pork belly, with main dishes like coconut-crusted salmon, chicken curry, or fusion dishes like Kerala shepherd's pie. This is a great spot for weekend brunch as well: Indique is known for bottomless brunch plates (think egg dosas, rice and coconut milk waffle, and chicken kebab eggs Benedict) at $25 per person. For $12 more, you'll get bottomless brunch cocktails like tamarind mimosas and Indique Bloody Marys too. Karma Modern Indian's chef Ajay Kumar once cooked at a White House State Dinner honoring former Indian Prime Minister Manmohan Singh. Today, you'll find him at this sleek restaurant near Penn Quarter in downtown D.C. His unique approach includes a bar stocked with organic wines, zucchini kofta, tandoori lamb chops, and coconut cake topped with a fresh raspberry puree. Downtown diners will find a bar perfect for happy hours and an airy dining room. The name Karma has meaning too: a portion of daily sales go toward local and global charities like DC Central Kitchen and Save the Children. Need something fast and affordable while sightseeing in Penn Quarter? Head to long-running local fast-casual Indian restaurant Merzi. You'll get in line and pick out each component of your bowl, Chipotle-style, from chickpeas to proteins like lamb, lentils, or tofu. Pick a sauce, more veggies, and chutney to finish off your meal — or add samosas or naan if you're really hungry. On a hot day, cool down at Merzi with a dessert like a pistachio or mango lassi. Pappe is a relative newcomer on 14th Street, opening up last year in 2018 and since then it's garnered a devoted fanbase. The beautiful dining room is decorated with draped fabric and photos of India. The menu draws on north Indian cuisine. Try signature entrees like butter chicken, fish curry with Chilean sea bass, braised lamb shank or branzino wrapped in a banana leaf. An open fire is used to grill kebabs, and vegetarians eat very well here with a big section of the menu devoted to vegetables dishes. Fast-casual Indian spot Rasa in Navy Yard is a rainbow of color, from the artwork to the pillows on the hanging chairs. The food is just as colorful too: build your own bowl by choosing ingredients like noodles or rice, charred eggplant, roasted Brussel sprouts, chicken tikka, spiced beef, sweet potato tikki, or turmeric ginger shrimp with sauces like coconut ginger or peanut sesame. You can also choose a bowl designed by Rasa's chefs. Round out your meal with garlic naan, chai, mango lassi, or even a fresh young coconut — all you need is a straw. Not only is Rasika a destination for presidents and D.C. power players, this iconic local restaurant spawned its own eponymous cookbook. Chef Vikram Sunderam is famous for dishes like palak chaat (a lighter than air crispy spinach). The menu includes a "tawa" or griddle section, serving up delicacies like lamb kathi rolls or chili mango scallops. There are barbecue dishes and curries too. Try the four-course tasting menu to experience all the facets of Rasika. There are Rasika restaurants in two outposts of the city: the original location in Penn Quarter and the newer dining room in West End near Georgetown. Treat Your Mom to Mother's Day Brunch in Washington, D.C. The 10 Best Places to Eat in Adams Morgan, Washington D.C.